Photos provided by Barb Heiss, Kevin Slick, Brian Keegan and others - thank you! Another great photo pose of the beautiful Veronica Carlson with ol' Drac. 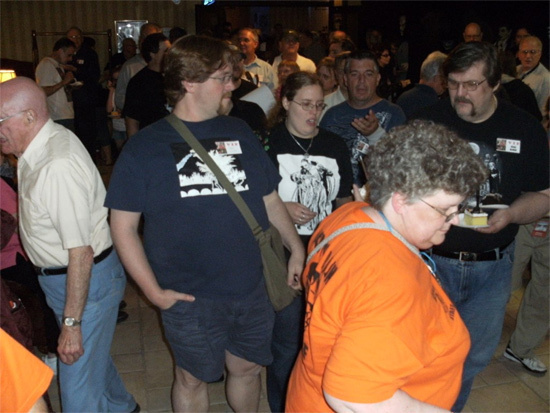 The Guest of Honor area was hopping on Friday at Bash. Dawn Wells (Mary Ann from Gilligan's Island) chats with fans at Monster Bash. How do you make a Monster Bash staffer happy...sit them down next to a Hammer Hprror starlet and watch him turn to monster mush. Kevin Slick with Veronica Carlson. He never dreamed this would happen when he was thirteen watching her in DRACULA HAS RISEN FROM THE GRAVE on The CBS Late Movie. 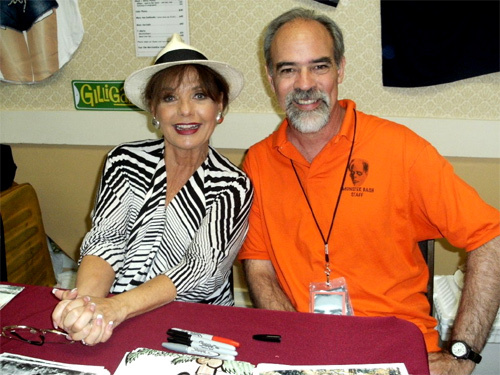 Dawn Wells (everyone's favorite on the island) and Kevin Slick! 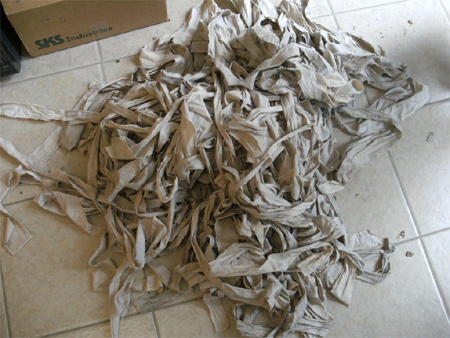 All that was left of The Mummy after make-up man Jesse Melchior took him on! 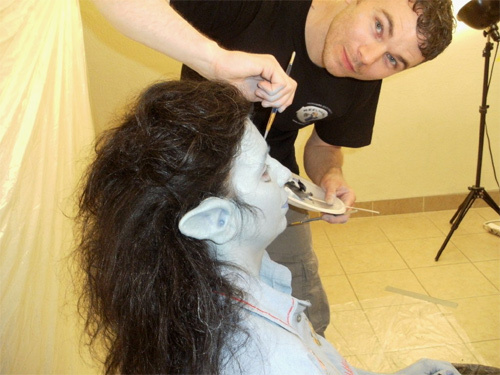 Jesse, Dan and John in the Monster Bash Make-Up studio...with Jesse and the Reel Magik team at work! Some people make a monkey out of Dan Weber. But, here Jesse Melchior makes a monster out of him! Kevin Slick and the eternally beautiful Caroline Munro of DRACULA A.D. 1972 and THE SPY WHO LOVED ME. "Holy Cow, I'm not Santa Claus...your breaking my legs!" The Frankenstein Monster (Dan Weber) has a seat on Kevin Slick. 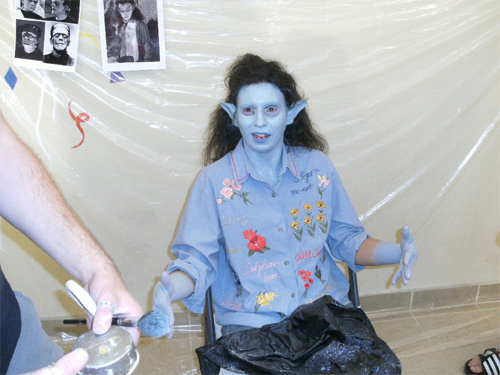 Ursula Adams goes under the brush as Jesse Melchior transforms her into the teenage vampire from BLOOD OF DRACULA. "How did my husband get me into this.....?" 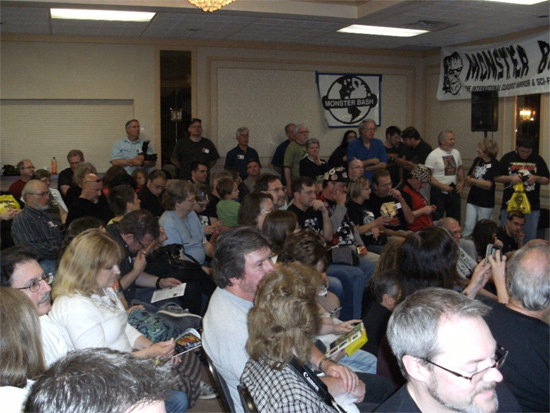 Just the front left flank of the movie room peanut gallery waiting for the next event. These are some serious classic monster fans. 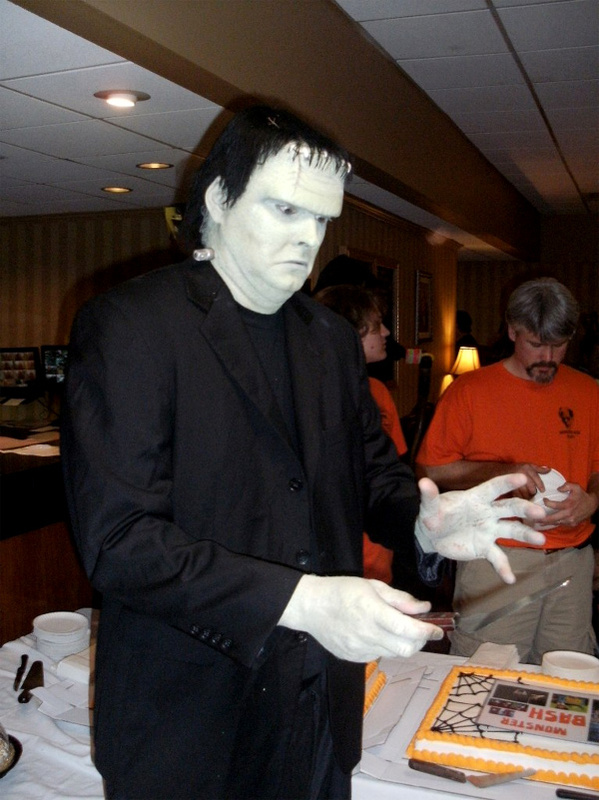 The Monster and Monster Bash staff get ready to cut and serve sheet cakes to 700 hungry fans on Saturday evening. "Cake? Cake? Where's my cake?" You ask, you got it at Bash! Bash staffer Alice Rader keeps it coming! 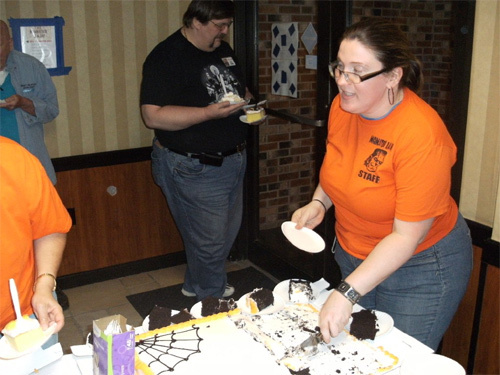 Basher Barb Heiss keeps the mob at bay by serving more cake.